Figure 1 A molecular graphics ribbon diagram of Rho prepared from the 2.8-Â crystal structure coordinates (PDB 1f88). The amino terminus (N) and extracellular surface is toward the top of the figure and the carboxyl terminus (C) and intracellular surface is toward the bottom. 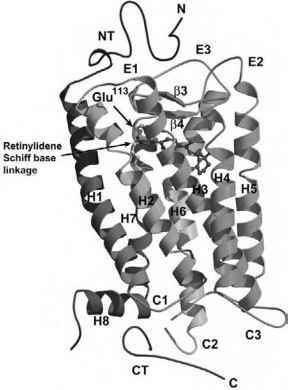 Seven transmembrane segments (H1 to H7), which are characteristic of GPCRs, are labeled. The RET chromophore is shown in magenta, and the side chain of Glu-113 and the retinylidene Schiff base linkage are shown to highlight the orientation of the chromophore in the binding pocket. The Schiff base imine nitrogen is labeled. The Rho crystal structure does not resolve a small segment of the C3 loop linking H5 and H6 or a longer segment of the carboxyl-terminal tail distal to H8. The a-helical transmembrane segments are tilted with respect to the presumed plane of the membrane bilayer, and they contain significant kinks and irregularities. the counterion to the cationic amine ligands. A pair of highly conserved Cys residues is found on the extracellular surface of the receptor and forms a disulfide bond. A Glu(Asp)/Arg/Tyr(Trp) tripeptide sequence is found at the cytoplasmic border of H3. This sequence is conserved in family A GPCRs and has been shown to be involved in G-protein interaction [4,5].